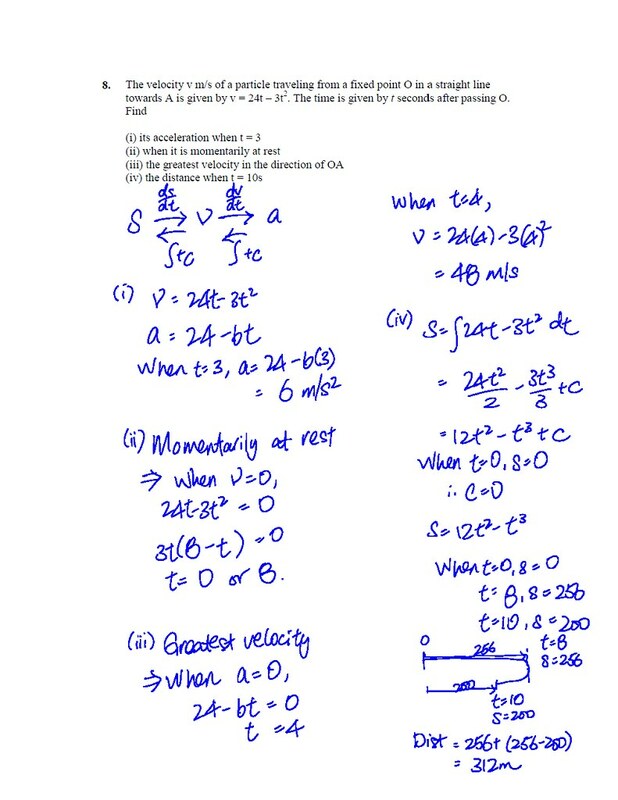 In the previous post on the typical questions on Kinematics, I am going to show up the step by step solution to answer a typical Kinematics exam question taken from my A-Math TREQ Book. How to get the acceleration equation? What does it mean by 'momentarily at rest' ? How to find greatest velocity? Every year and in almost every paper, you will be asked to find Distance. The examiners are testing on your understanding of displacement, displacement, momentarily at rest. You must learn how to find it accurately and within the shortest period of time. Learn from this example well! I was looking through 2008 GCE O Level Additional Mathematics Exam Papers (Subject Code: 4038) and as expected, there was a Kinematics question (worth 6 marks) in Paper 1. Kinematics is a application topic for Differentiation and Integration. To master this topic, you do not necessarily need to bring in your physics knowledge though it could be useful at times. Instead, how I get my students to be a master in this topic is to be familiarize with a KINEMATICS VOCABULARY LIST. I would say for Kinematics, it is one of the few topics in A-Math which uses extensive vocabulary. This is also the reason for you to decipher the meaning behind these words. So do you know the meaning behind these words? I would love to hear about it in the comments section. I would be sharing the step by step solutions for Question 8 in the next post. Subscribe to my blog to be updated again!